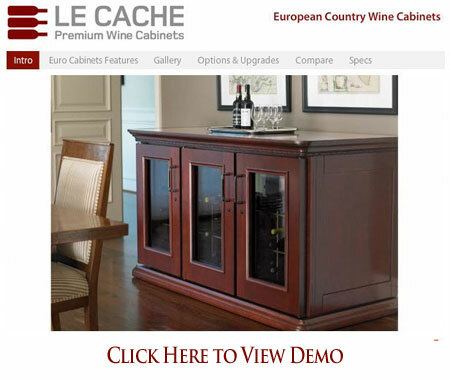 Le Cache Euro 5200 Wine Cabinet Provincial Cherry (P/N 754). Designed by acclaimed, Pinnacle Award-winning designer Martin de Blois, our European Country Series wine cabinets evoke the timeless elegance of European furnishings. Architectural details such as crown and base molding, paneled sides, hardwood French doors and hand-carved accents showcase fine wine collections with a sense of luxury and style. Sealed seams, premium insulation and tinted double-paned glass provide thermal and UV protection.These options are included in the price of your wine cabinet. I had a problem with the cooling unit on my LaCache wine cabinet and contacted customer service. Response was great and they helped me with a warranty replacement part very quickly. Great group to work with. Far exceeded my expectations. This wine cabinet blends well as a quality piece of furniture in any home.